Good Things Love Water is the story of surfing as told by a sea of different voices. 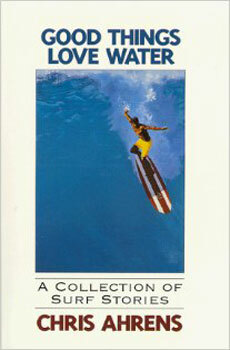 The first waves ever ridden at Waimea Bay by Greg Noll, Mike Stange, and Mickey Munoz; Phil Edwards' first trip to Hawaii at age 15, the world of Bob McTavish, a beloved car owned by a couple of unknown surfers, and 21 other short stores are woven together in a sometimes dramatic, sometimes hilarious, sometimes tragic account of surfing's rich history. Chris Ahrens lays bare the hearts of our heroes and surfers we have not encountered until now.